40 followers in 5 colors. Each player will use one of their followers as a score marker. The start tile is placed in the center of the table, while the scoreboard is placed on the edge of the table. The other tiles are shuffled and placed on a face-down stack. Each player takes his 8 followers (of his color) and puts one of them on the scoreboard (on number zero). Now the players decide who can start the game. Draw and place one new land tile. A player can choose if he want to put one follower from his supply on the just placed tile. 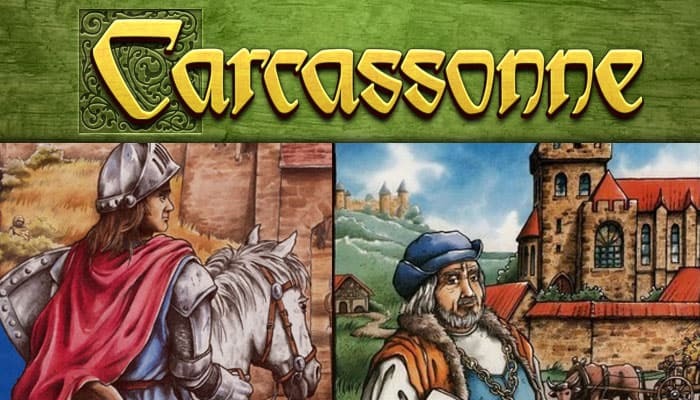 When by placing a tile one or more roads, cities or monasteries are completed, then points will be received immediately. Return possible thieves, knights or monks to their supply. The player's turn is now over and the next player (clockwise) can start his turn. The new tile must be placed with at least one edge abutting one previously placed tile. The new tile cannot only be connected by a corner with a previous tile. 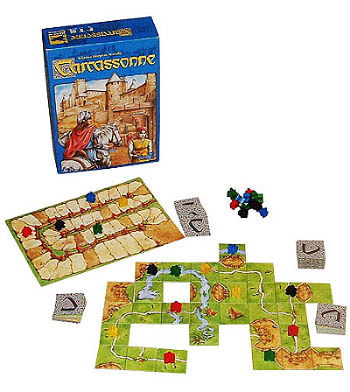 In the rare circumstances where a drawn tile cannot be placed, the player returns the tile to the box and draws another tile. The player may only place one follower on a turn. The player must take it from his supply. The player may only put it on the tile he just placed. 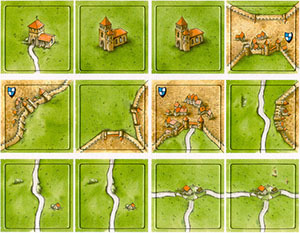 The player must choose where to deploy the follower on the tile: thief on a road, knight in a city, monk in a cloister or farmer in a field. The player may not place her follower on a road, in a city or in a field if that section is connected to another tile where there already is a follower. 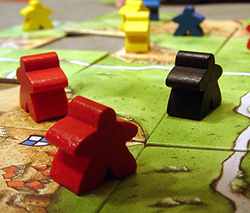 When a player has deployed all his followers, he continues to play tiles each turn. A player is never allowed to retake one of his followers from a tile, although they are returned when roads, cities or monasteries are finished. Then, the player's turn is over. After, in clockwise order, the next player takes his turn, followed by the next one, etc. Note: If after placing a tile something get completed, it's immediately scored before the next player's turn.